The incident took place last Friday in the South Hebron Hills, and was filmed by an activist from the Ta’ayush rights group, which regularly accompanies Palestinian shepherds and farmers who claim harassment at the hands of Israeli settlers. In the clip, the settler from the illegal “Havat Har Mor” outpost can be heard telling the activists that they are ruining the “good neighborliness” he has with the Palestinians. 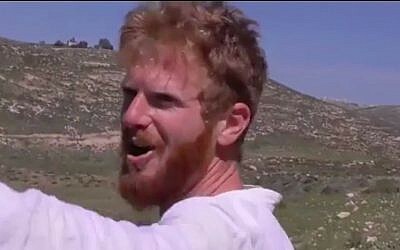 The settler, whom a spokesman for Ta’ayush identified as Yishai, tells them that they have encroached onto his land. The footage then shows Yishai letting his dog off its leash and allowing the animal to run after the flock of roughly 30 sheep. Pictures from the left-wing NGO showed that several of the sheep had had their tails bitten off entirely by the pit bull. While a spokeswoman for the Israel Police’s Judea and Samaria District said that her division had opened a probe into the matter, she said that they had not arrested the settler. The suspect did not respond to The Times of Israel’s requests for comment. Zionist Union lawmaker Eitan Cabel called the incident “horrific” in a message to his followers on the Telegram messaging application. “Any person who does this is not even worthy of the title of ‘animal,'” he added. In September, a different Israeli settler was arrested after he sicced his own dog on a Border Police officer, during the demolition of an illegally built structure in his northern West Bank outpost. The dog bit the border guard in the leg at the Ein Amsha outpost, and the man was sent to Petah Tikva’s Beilinson Hospital for medical treatment. The officers had been called to Ein Amsha to assist the Defense Ministry’s Civil Administration in the demolition of a building in the outpost, which is located just south of the Palestinian city of Nablus.